New Delhi: Next Skills is a solution platform which brings together best of class products and services to solve key issues connected with students access to gadgets and services that are required to facilitate the learning process. Next Skills has recently announced the launch of DigiTALent, which is a comprehensive package designed for college students. This package bundles a branded laptop, smartphone, internet connectivity customized for every student’s need. To make the most of the growing popularity of digital learning, DigiTALent incorporates licensed content from the leading digital skilling platform TalentSprint and a project package with mentor assistance from TOOOPLE. 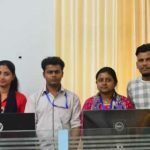 DigiTALent thus provides a “Vocational Education Re-Engineering Program” (VERP) designed for engineering students during their 4 years of graduation program. One of the key challenges repeatedly faced by corporate recruiters is that the theoretical knowledge imparted by colleges is no longer enough for an intensely connected global economy. One who does professional projects will go a long way in their job readiness. With massive automation and Artificial Intelligence impacting the number of jobs on the one hand and, the lack of employable skills among graduates on the other, is making it difficult for companies to find the right talent.